Hardness of the water: if your water is very hard it may require a larger system. A water test may be required. Manual vs automatic operation: do you want to manually control the system or do you prefer to have it operate automatically and without your frequent attention? Semi Automatic: This kind of system requires no electrical connection. The regeneration cycle is initiated manually using a twist-timer dial, whenever you believe the system needs to be regenerated. Fully automatic - timer controlled: Features a digital timer control, which is set to regenerate automatically at a specific time and day, based on your estimated water use. For example, your system may be set to automatically regenerate at 2am every 2nd day. Fully automatic - microprocessor controlled: Features a digital water meter control that continuously calculates water usage, and automatically regenerates only when demand requires. This digital control also shows other useful information such as instant flow rates, total volume of water consumption, and water used since the last regeneration cycle. Softeners used in small commercial operations usually need a microprocessor control as regeneration may be required more than once per day. 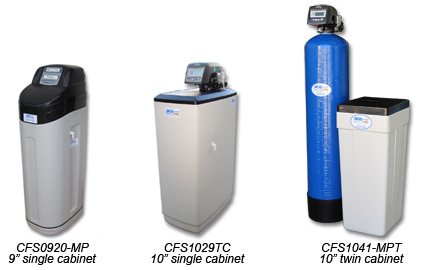 This table outlines our residential water softener model range and key technical information. It's most important when choosing a water softener to consider the amount of the water that needs to be treated daily, therefore the household size is a very important factor. * Only available in twin tank style. Includes Turbulator to obtain maximum cleaning of dirt and iron particles from the resin beads, resulting in a more efficient regeneration. ## Guideline only. Based on daily use per person of 250 litres. For more help and information, please contact our Customer Service Team on 1300 166 253.